Horde players must first complete the quest Lil' Tika before this pet will appear on the vendor. Rushes the enemy, dealing 295 Beast damage and causes the user to go first next round. Leap to the target's face, instantly dealing 295 Beast damage and increases your speed by 100% for 1 round. If the user kills an enemy with Ravage, they restore 394 health. If the user kills an enemy with Bloodfang, they restore 492 health. 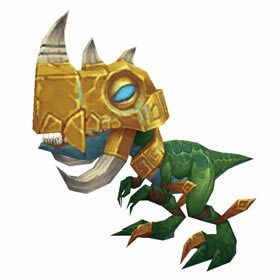 So far (11/25/19) only Lil' Tika and Zandalari Shinchomper have the Aura of Gonk ability. As Unknownhand points out, you can't even use it until 8 rounds into a battle. For this reason, I doubt you would ever begin a battle with this guy out front. Once the aura takes effect, a triple damage ability (like Build Turret) will do a triple heal to the front line pet. The aura lasts 4 rounds and takes 4 more rounds to cool down. This ability adds new dimension to pet battles. Was rummaging through random pets, and stumbled upon this little jewel. Wow! I know where my next 200 PPCs are going. I see so much potential for mayhem in it's move set that I'm actually excited to see what it can accomplish. Has great synergy potential with other pets besides being awesome on its own. Aura of Gonk: you have to wait 8 rounds before you can use the ability. Once used it has a 4 round CD before you can use it again. The healing only happens to the front line pet no matter what sort of damage is occuring(Turret, Immolation, Cyclone, Scorched Earth *Weather) Basically any damage happening to the enemy pet(s) will proc a heal for each time it hurts an enemy pet. Peddlefeet's Rapid fire shoots 6 times for almost 600 hp gained. Sunborn's Omnislash as well. 2 hits per pet. Most predators favored the soft parts of their prey to attack first. Lil' Tika prefers to go for the face.